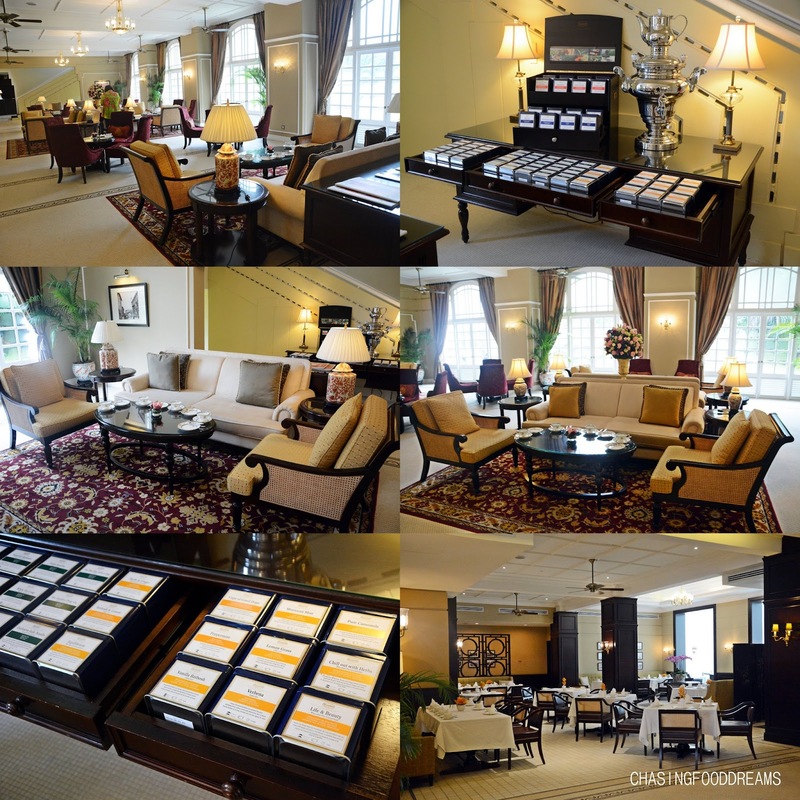 The Majestic Hotel Kuala Lumpur has come a long way since 1932, a grand hotel back in the heyday which is highly favored by colonial elites and high society visitors. The hotel was the venue to be seen and heard and hosted quite its fair share of extravagant parties, Sunday Curry Tiffin lunches and tea dance. After the restoration of this heritage building by the YTL Hotels, The Majestic Hotel Kuala Lumpur has now taken on a new pride in continuing its heritage of a grand hotel beautifully remodeled and expanded with new wings. 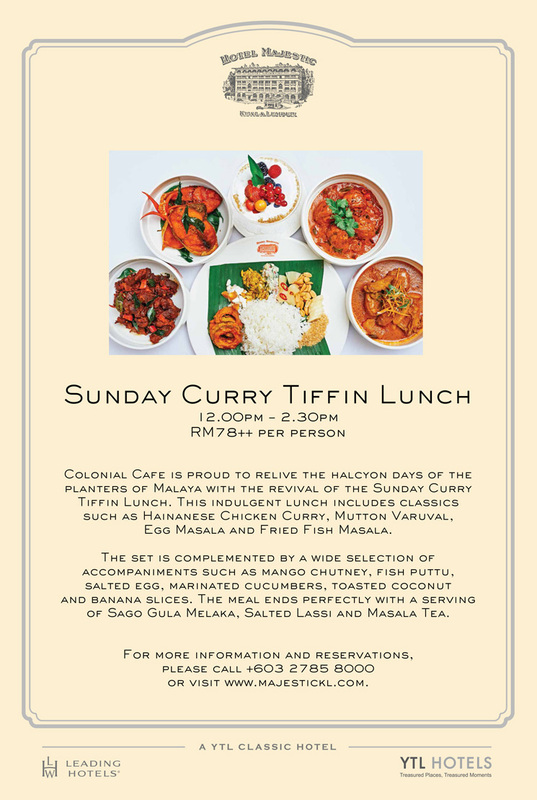 With the new life, The Majestic Hotel Kuala Lumpur is also proud to bring back a taste of its colonial days with the Sunday Curry Tiffin Lunch at their Colonial Café every Sunday. The Sunday Curry Tiffin Lunch was a tribute to the days of the planters of Malaya where lunches are brought to work from home in tiffin carriers. At Colonial Café, the Sunday Curry Tiffin Lunch is presented the majestic way and is available every Sunday from 12pm to 2.30pm. As we arrived at The Majestic Hotel Kuala Lumpur, we had to pass the conservatory that connects the hotel to the Colonial Café. 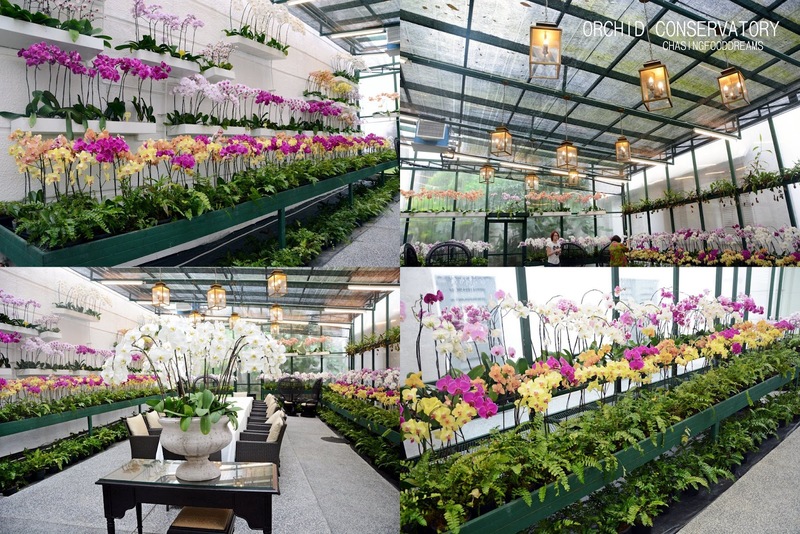 The conservatory has now been restored and converted to the Orchid Conservatory where thousands of exotic orchid blooms fill the whole room with exceptional exotic beauty. It’s my first time here and I just couldn’t resist the mesmerizing beauty. One can now enjoy Afternoon Tea experiences in the orchidscape or even host private functions but reservations are required as this is an exceptionally popular room. As I headed into the Colonial Café, there is an immediate sense of heritage through its ambience and décor. Filled with plush colonial décor and furniture, The Colonial Café serves up authentic classical cuisine from the colonial era. Plush sofas and armchairs with wood, gold chandeliers, antique lamps, majestic carpets set the colonial mood at the lounge area whereas pristine white table settings on wood furniture sets the ambiance for the dining section. A gorgeously restored bar in dark wood with leather bar stools, a grand piano with a dome chandeliered ceiling grace the center of the room. Choose dining in the room or the small open conservatory at the café. As soon as we were seated and orders are in, waiters dressed in smart pressed coat and uniform proceeds to set our table with banana leaves to prepare our Sunday Curry Tiffin Lunch. Indeed carried out the majestic way, the team discreetly sets our plates lined with fresh banana leaves and quite a few condiments together with rice. The condiment list is pretty unique with a few familiar ones and a few interesting ones. We had a delicious sticky and sweet Mango Chutney, Fish Puttu, Marinated Cucumber, Pineapple Slices, Salted Egg,, Toasted Coconut, Toasted Salted Peanuts and fresh Banana Slices. I never knew fresh banana or pineapple slices were served but was ensured that this is what was served back during the colonial times. The condiments are refillable so do not hesitate to ask from more if you have a favorite. Same goes for the rice as well. The tiffin serving up the dishes is truly beautiful and elegant. The carriers are porcelain while the handles are copper. Specially made for the hotel, the tiffin are just as posh as the hotel and its décor. The Sunday Curry Tiffin Lunch set comes with a set of Hainanese Chicken Curry, Mutton Varuval, Egg Masala and Fried Masala Fish. I had a glorious time spooning the Hainanese Chicken Curry gravy onto my rice. It’s not as thick as I would have love it to be but the flavours are a good balance of spices and heat. The chicken and potatoes are cooked well and tender. The Mutton Varuval is cooked till dry and thick. Tender chunks of mutton are boldly spiced up with pungent assorted spices and chili as well as curry leaves for aroma. The Masala Fish came in thick and large cutlets fried to golden. It’s well fried and nicely seasoned. My only gripe is that it was a tad dry. I really enjoyed the Egg Masala for its rich flavours. Simple as it can be, the egg cooked in the heavy masala sauce worked so well with all the other dishes and condiments. My platter of the yummy banana leaf and curry lunch! After working my way through the platter of yumminess, we were also served a shot of Salted Lassi to wash all the richness of the spices down. Love the Salted Lassi with the sprinkling of fenugreek seeds! Juices are ordered separately and I had a refreshing Pineapple Juice. What seals the lunch are Sago Gula Melaka and Masala Tea! The Sago Gula Melaka is served in a martini glass for elegance and taste rich and luscious from the thick sweet gula Melaka and creamy coconut milk with little pearls of sago.